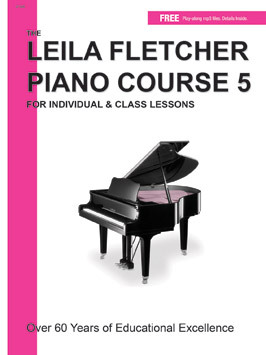 Leila Fletcher Piano Course Book 5 has been expanded by 18 pages from the original Book 5. Repertoire selections now include titles like Song of Joy, Spanish Dance, Sun Flower Slow Drag, The Happy Song, Canon in D, Wedding March, Jesu Joy of Man’s Desiring and many more. All of the original information and works complied by Leila Fletcher are still included. Titles now carry original catalogue numbers, as well as biographical and historical information. In addition to being a natural continuation of the Leila Fletcher Piano Course Book 5 works well as a quick study collection, sight reader and recreational book. Fantastic adult repertoire collection!